Albert Namatjira is one of Australia’s great artists, and perhaps the best known Aboriginal painter. His western style landscapes – different to traditional Aboriginal art, made him famous. Fame led to Albert and his wife becoming the first Aborigines to be granted Australian citizenship. 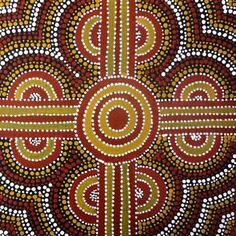 Aboriginal art is the oldest art form known to man. Engravings in Arnhem Land have been dated to at least 60,000 years. Originally, aboriginal art was used for communication and as a teaching aid. Some aboriginal art is sacred and recounts stories from the Dreamtime: the time when indigenous Australians believe the earth was created.